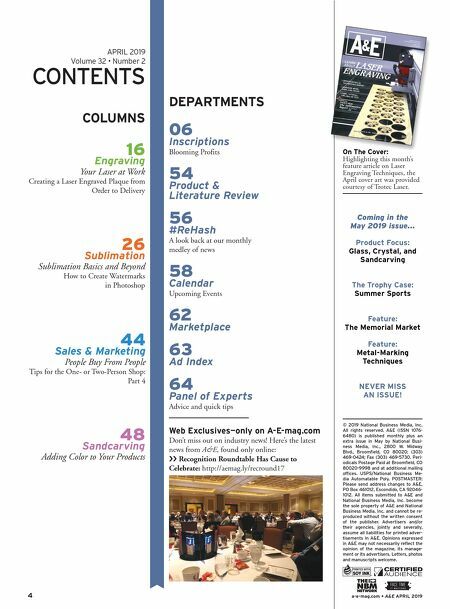 4 a-e-mag.com • A&E APRIL 2019 Web Exclusives—only on A-E-mag.com Don't miss out on industry news! Here's the latest news from A&E, found only online: ›› Recognition Roundtable Has Cause to Celebrate: http://aemag.ly/recround17 DEPARTMENTS 06 Inscriptions Blooming Profits 54 Product & Literature Review 56 #ReHash A look back at our monthly medley of news 58 Calendar Upcoming Events 62 Marketplace 63 Ad Index 64 Panel of Experts Advice and quick tips COLUMNS 16 Engraving Your Laser at Work Creating a Laser Engraved Plaque from Order to Delivery 26 Sublimation Sublimation Basics and Beyond How to Create Watermarks in Photoshop APRIL 2019 Volume 32 • Number 2 CONTENTS On The Cover: Highlighting this month's feature article on Laser Engraving Techniques, the April cover art was provided courtesy of Trotec Laser. Coming in the May 2019 issue... Product Focus: Glass, Crystal, and Sandcarving The Trophy Case: Summer Sports Feature: The Memorial Market Feature: Metal-Marking Techniques NEVER MISS AN ISSUE! April 2019 A&E Magazine • MEDALS, MEDALLIONS, AND RIBBONS • LASER ENGRAVING TIPS AND TRICKS • THE SUBLIMATION REPORT See A&E come to life! 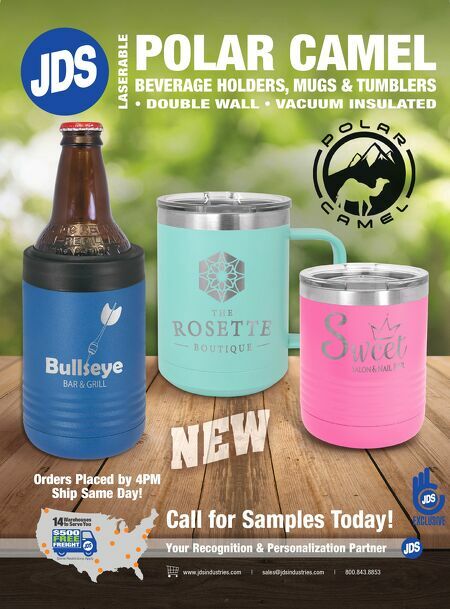 THENBMSHOW.com Awards, Engraving & Everything Personalized April 2019 a-e-mag.com SPECIAL DOUBLE ISSUE: The Sublimation Report • OPPORTUNITIES IN THE WEDDING MARKET • HONORING MOMS, DADS, AND GRADS • COREL TUTORIAL: THE ABCs OF TEXT LASER LEARN ABOUT ENGRAVING AFTER PAGE 32 48 Sandcarving Adding Color to Your Products 44 Sales & Marketing People Buy From People Tips for the One- or Two-Person Shop: Part 4 © 2019 National Business Media, Inc. All rights reserved. A&E (ISSN 1076- 6480) is published monthly plus an extra issue in May by National Busi- ness Media, Inc., 2800 W. Midway Blvd., Broomfield, CO 80020; (303) 469-0424; Fax (303) 469-5730. Peri- odicals Postage Paid at Broomfield, CO 80020-9998 and at additional mailing offices. USPS/National Business Me- dia Automatable Poly. POSTMASTER: Please send address changes to A&E, PO Box 461012, Escondido, CA 92046- 1012. All items submitted to A&E and National Business Media, Inc. become the sole property of A&E and National Business Media, Inc. and cannot be re- produced without the written consent of the publisher. Advertisers and/or their agencies, jointly and severally, assume all liabilities for printed adver- tisements in A&E. Opinions expressed in A&E may not necessarily reflect the opinion of the magazine, its manage- ment or its advertisers. Letters, photos and manuscripts welcome.